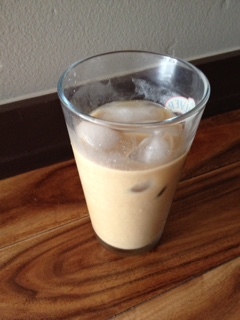 Keep the calories at a minimum with this great tasting iced latte. If you prefer vanilla, substitute the almond extract with pure vanilla extract. If you like your coffee strong, add another 1/4 cup of coffee to the almond milk mixture. Brew coffee, if using, and let cool for few minutes. Pour almond milk in large glass. Add ice cubes and enjoy.